The Farmer’s Alliance for Integrated Resources held their annual banquet on February 12, 2015 at the Fox Hill Country Club. The event drew more than 100 local farmers and supporters, and honored local members. “We are a group that believes in coexistence, and we believe that we should have the right to choose the way you like to farm or ranch, and you should be able to do that in harmony with your neighbors. The people in this room, you are looking at second, third, fourth, fifth and even sixth generation farmers in Boulder County. They have chosen to live in this area, and they have chosen to farm a lot of this open space. A lot of the farms in the area have kept Boulder County such a viable agricultural producing area,” said Dan Lisco, President of the Farmer’s Alliance for Integrated Resources. 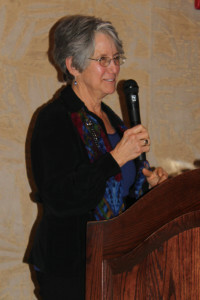 Lisco highlighted the main achievements of FAIR over the past year, which included agricultural tours, water tours, participation and sponsorship of From Our Lands to Your Hands, participation in the Boulder County Fair, the purchase of livestock at the Boulder County Fair, and food donations to local food organizations, including the meat from the livestock purchased at the fair. The guest speaker for the event was Paul Danish, a veteran of two terms on the Boulder County City Council and nine years as a Boulder County Commissioner. Danish spoke about the importance of agriculture in Boulder County. “As farmers, and as scientists, I suspect you are deeply aware that the American people take your work for granted. When it comes to revolutionary accomplishments, that Americans take for granted, the accomplished of the American farmer stand first among equals,” said Danish. “If you want to meet a real revolutionary, shake hands with the person sitting next to you,” he added. Mr. Ted Bendalow, a member of FAIR, then introduced Jane Uitti, the former Executive Director of FAIR, as the 2015 Friend of Agriculture in Boulder County Award Winner. “Five years ago, a group of farmers, those farmers being the farmers in Boulder County, farming the largest amounts of ground, all family farmers, the largest group of conservation easement holders, the largest farmers of Boulder County open space, feeling very frustrated and not heard from, decided to form an organization. Who did the work to get it done? Jane,” said Bendalow. In recognition of what she has done, this recognition is long deserved and well deserved. I have the honor and privilege and welcoming and thanking the 2015 Friend of Agriculture in Boulder County. “I want to say I am so proud of FAIR, and I am so honored to work with them and for them, for you guys. I am so proud of all of the farmers here in Boulder County who provide local food. I am very proud to receive this honor,” she said. FAIR membership is comprised of diversified family farmers and ranchers from around Boulder County who support sustainable agriculture. FAIR members believe that the current County Cropland Policy reflects the diversity of all segments of agriculture in Boulder County, within a policy that fosters coexistence in the agricultural community. FAIR is committed to sustaining and supporting a wide range of approved farming practices, emphasizing the production and sale of local food and feed, and education of the public and policy decision makers about the best farming practices that promote sustainability of our soils and water. FAIR supports its education and outreach efforts through contributions from its members and through auxiliary organizations that promote farming in Boulder County and in Colorado.